We are enjoying the big city lights of Carlisle tonight. In the last couple of days we walked close to 20 miles between Gilsland and Carlisle with an overnight at the Low Rigg Farm. The innkeeper at the Bush Noon Inn was great. He even drove us down from the inn to the trail. It doesn’t sound like much but the inn is a mile off of the trail and it was pouring rain. It rained much of the morning but we had a couple of great spots to check out. Birdoswald is a Roman era fort that has been brought to the surface. 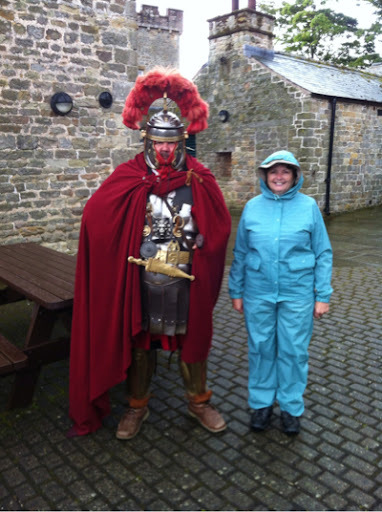 They also have Roman Centurions! 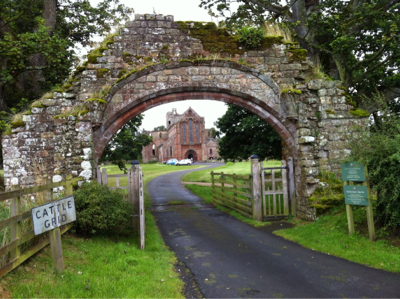 The next stop was the Lanercost Priory. The church is built, as are most “newer” buildings along the wall with wall stone. That is why there is so little of the 2000 year old wall left remaining but there are so many farm houses, barns and churches along the wall path built of wall stone. We spent the night at the Low Rigg Farm in Walton. Not much around Low Rigg but we did take a cab into town and spent the evening at a local tavern. 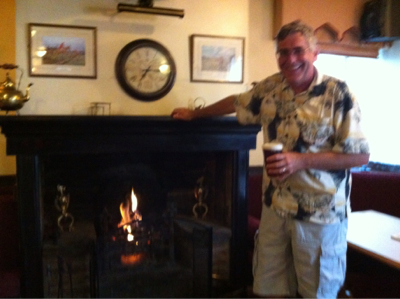 They even had a fire going in the pub to cut the chill due to the rain and chill (final photo). 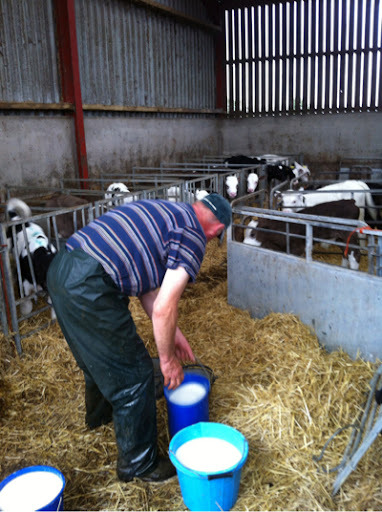 One of the highlights of the Low Rigg farm was feeding time for the 1-month old cows. Quite the frantic bunch. Saturday was another day of rain but as we approach the west coast the trail gets flatter. Flat trail in the rain sure beats 16 miles of up and down in the sunshine. 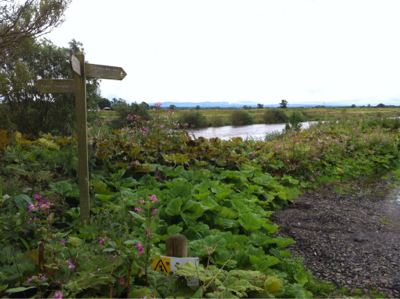 We walked through miles of mushy farmland to Crosby-on-Eden where we got our first glimpse of the River Eden that we will follow to the coast. A few more miles and we were in Carlisle with only 14.5 miles to go in our coast-to-coast walk. Overnight in Carlisle with an Italian feast for carb loading and we are good to go for tomorrow! As always, a pint thinking of you.